Leaders clash over how to stave off economic catastrophe. Congress passed reform, but the debate still rages. States cut budgets, staff as students protest nationwide. 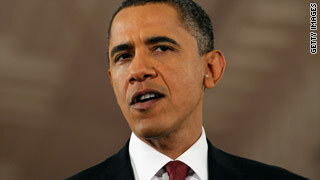 Washington's mounting budget deficit sparks concern. Arizona law reignites debate over illegal immigration. Will President Obama and the GOP-led House be able to work together? Opinion: Can Obama get back on track? 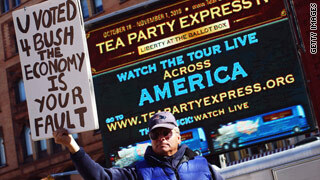 Tea Partier to GOP: Beware! Amid fears of a depression, the Democratic-led Congress passed a stimulus bill with only three GOP votes. The White House says the bill funded 3 million jobs, while opponents point to its $787 billion price tag and a jobless rate around 10 percent. This year's budget includes funds for a second stimulus; will the administration use it? Many voters are concerned about the ballooning U.S. budget deficit, which is the amount Washington spends each year beyond its means. Deficits can lead to rising prices and higher consumer interest rates for loans. Democrats say the $940 billion health care reform law extends coverage to about 32 million additional Americans, but Republicans want to repeal it, labeling it expensive, anti-business and ineffective against rising costs. Arizona passed a law cracking down on illegal immigrants that critics say promotes racial profiling. The law set off nationwide debate, and some states are considering similar laws. Recession-starved budgets have prompted officials in many states to lay off elementary and secondary school teachers, increase college tuition and cut programs at all levels, triggering coast-to-coast protests. A deadly rig explosion and catastrophic oil spill off Louisiana have reignited debate over the country's energy policy, with environmentalists and even some Republicans questioning whether offshore drilling makes sense. President Obama ordered 30,000 additional troops to the U.S.-led war in Afghanistan, while his plan to withdraw all U.S. combat forces from Iraq by August remains on track. Recently failed terrorist plots on U.S. soil have highlighted the political divide over whether terrorist suspects should be tried by military tribunals or in civilian courts and raised concerns about how to defend against foreign and home-grown threats. Evident during town hall-style meetings about health care reform and by the formation of the Tea Party movement, anger has provoked some independent voters to seek a voice outside the traditional two-party system. Presidents typically lose seats in Congress in midterms, but observers say this year's election has the potential for the biggest shift since the 1994 Republican Revolution, largely as a result of President Obama's ambitious first-term agenda. Can Obama sell voters on Democratic Congress? Polls indicate many voters are embracing an anti-incumbent mood against candidates in both major parties, but the Democratic majority in Congress could bear the brunt, analysts say. How much can Bill Clinton help Dems? Which issue do you care about most? Jobs? Schools? Immigration? Something else that touches the people and places where you live? Join the election conversation tell us what you think. CNN's Polling Center includes every major public poll covering national trends and issues as well as selected House, Senate and gubernatorial races.